Chocolate bark was actually the first foodie gift I ever made for a friend - and something I've been making every Christmas for at least 15 years. Why? When I was about 8 or 9 my teacher in primary school taught us all how to make Rocky Road (this Super Simple Kid Friendly Rocky Road Recipe actually!) and I fell in love with making homemade chocolate treats. When our friends at The Reject Shop asked me if I could come up with a delicious recipe for their customers - I knew I had to put together something a little more than that. To help you really wow your loved ones this Christmas, I put together a collection of delicious chocolate treats that are the perfect Homemade Christmas Gift! 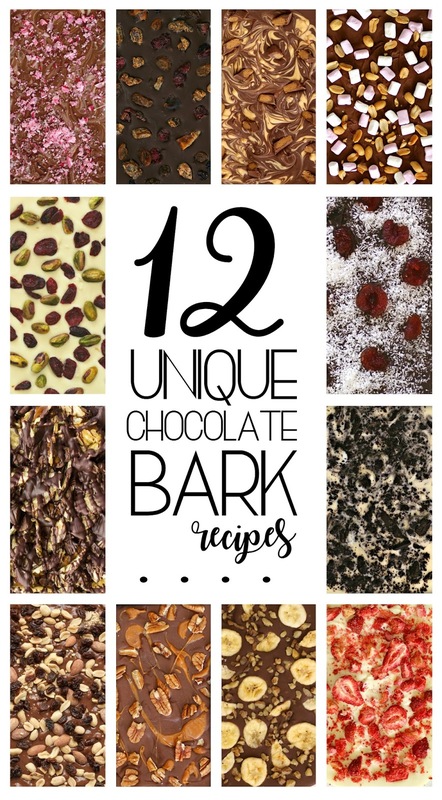 All 12 of these Homemade Chocolate Bark Recipes are super easy - all you have to do is melt, pour and sprinkle. They're perfect for making with kids and are what we like to call deceptively simple... that is, they make you look like a bit of a domestic goddess even though it takes all of five minutes to make them. So let's get onto the recipes, shall we?! A festive favourite and the first chocolate bark creation I ever made. This combines crunchy mint candy cane pieces with swirls of milk and white chocolate. How to make it: Melt your milk and white chocolate in separate bowls. Place alternate spoonfuls of your melted milk and white chocolate onto a baking tray lined with baking paper. Swirl your chocolate together with a toothpick or knife. Tap your tray on your bench to ensure you have an even layer and sprinkle your crushed candy canes on top. Chill in the fridge until set and break apart with a knife or your hands. Store in the fridge in an airtight container for up to 2 weeks. Inspired by the flavours of an old fashioned Christmas Pudding, this fruit cake chocolate bark is perfect for grown-ups with its dark chocolate base - but can also be made with milk or white chocolate. For a small batch, use 200g dark chocolate + 1/2 cup mixed fruit - feel free to add walnuts or nuts if you like, too! How to make it: Melt your dark chocolate and spread it onto a baking tray lined with baking paper. Sprinkle on your mixed fruit and gently press it into the top. Chill in the fridge until set and break apart with a knife or your hands. Store in the fridge in an airtight container for up to two weeks. Um, who doesn't love chocolate and peanut butter together?! We spotted Reese's Peanut Butter Cups at The Reject Shop and knew we needed to make a bark recipe with them. Combining swirls of peanut butter and milk chocolate with peanut butter cup chunks, this is a delicious salty sweet sensation. How to make it: Melt your milk chocolate and spread it onto a baking tray lined with baking paper. Dollop on your melted peanut butter and swirl it with a knife or toothpick. Add your peanut butter cup chunks and chill in the fridge until set and break apart with a knife or your hands. Store in the fridge in an airtight container for up to two weeks. A classic chocolate treat, Rocky Road combines pillowy soft marshmallows with crunchy nuts. If you're looking to add a little extra oomph, add some chopped lolly raspberries (like this Kid Friendly Rocky Road Recipe) or glace cherries and sprinkle them on top. How to make it: Melt your milk chocolate and spread it onto a baking tray lined with baking paper. Sprinkle over your marshmallows and peanuts and carefully press them into your melted chocolate. Chill your bark in the fridge until set and break apart with a knife or your hands. Store in the fridge in an airtight container for up to two weeks. Inspired by festive Christmas colours, this chocolate bark combines crunchy pistachios with slightly tart dried cranberries for a festive looking treat. How to make it: Melt your white chocolate and spread it onto a baking tray lined with baking paper. Sprinkle on your cranberries and pistachios and gently press it into the top. Chill in the fridge until set and break apart with a knife or your hands. Store in the fridge in an airtight container for up to two weeks. This one's for the grown ups. Combining dark chocolate with coconut and cherries (either glace or dried cherries) for a sophisticated treat. How to make it: Melt your dark chocolate and spread it onto a baking tray lined with baking paper. Sprinkle on your cherries and gently press it into the top. Sprinkle your coconut over the top and chill your bark in the fridge until set. Break apart with a knife or your hands. Store in the fridge in an airtight container for up to two weeks. Now, this might sound odd but this is the perfect mix of salty and sweet - don't know it til you try it! How to make it: Melt your milk chocolate and spread it onto a baking tray lined with baking paper. Sprinkle over your chips and gently press them into the top of your melted chocolate. Chill in the fridge until set and break apart with a knife or your hands. Store in the fridge in an airtight container for up to two weeks. A favourite of both kids and adults, this one works with milk, white or dark chocolate and can be made gluten free using gluten free oreo style cookies! Jesse calls this Trail Mix Chocolate Bark but it reminds me of my favourite fruit and nut chocolate blocks so you can call it whatever you like. Customise this recipe to your like by using a mix of your favourite fruit and nuts. How to make it: Melt your milk chocolate and spread it onto a baking tray lined with baking paper. Sprinkle over your fruit and nut mix and gently press them into the top of your melted chocolate. Chill in the fridge until set and break apart with a knife or your hands. Store in the fridge in an airtight container for up to two weeks. The trickiest recipe of the bunch but perhaps the most delicious, this Turtle Chocolate Bark needs to come with a warning as it's dangerously delicious! How to make it: Melt your milk chocolate and spread it onto a baking tray lined with baking paper. Carefully melt your caramels in the microwave or on a pot on the stove, stirring frequently. Once your caramels are melted, carefully (they will be SUPER hot!) drizzle the melted caramel over your melted chocolate layer. Sprinkle your pecans on top and gently press them into the top of your melted chocolate. Chill in the fridge until set and break apart with a sharp knife. Store in the fridge in an airtight container for up to two weeks. Inspired by Ben and Jerry's Chunky Monkey Ice Cream, this combines banana chips (or freeze dried banana) with walnuts for a delicious treat. You can even switch the banana chips out for lolly bananas for an extra sweet treat. How to make it: Melt your milk chocolate and spread it onto a baking tray lined with baking paper. Sprinkle on your bananas and walnuts and gently press it into the top. Chill in the fridge until set and break apart with a knife or your hands. Store in the fridge in an airtight container for up to two weeks. 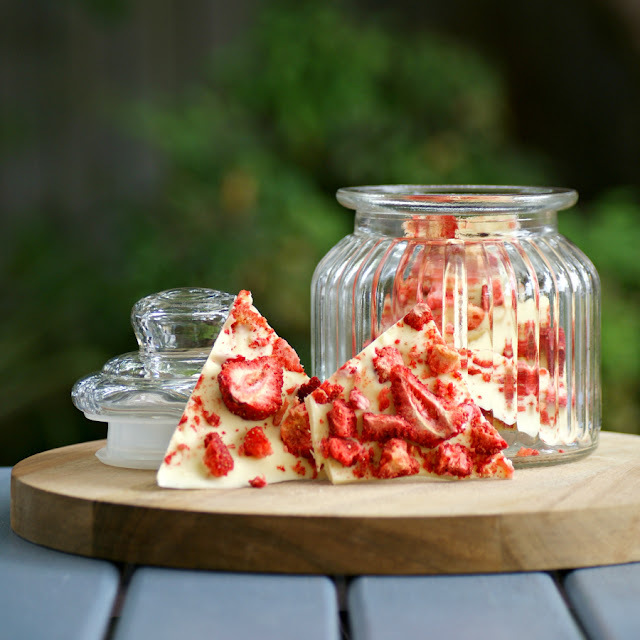 Just like chocolate covered strawberries without all the mess, this Strawberries and Cream Chocolate Bark also works really well with milk or dark chocolate! How to make it: Melt your white chocolate and spread it onto a baking tray lined with baking paper. Sprinkle over your freeze dried strawberries. Chill in the fridge until set and break apart with a knife or your hands. Store in the fridge in an airtight container for up to two weeks. Now you've got all the recipes - it's time to package them up! The Reject Shop have a wide range of packaging options for your chocolate bark - and all at super cheap prices! Add some cellophane and a cute ribbon here or there, pop on a gift tag and you're ready to gift! Speaking of gift tags; stay tuned because we're working on some Printable Christmas Gift Tags for an upcoming post. Be sure to follow us on Facebook, Instagram or Pinterest so you don't miss out! But tell me, do you like to make delicious treats for your friends at Christmas? What are some of your go-to holiday recipes?